PMBull’s silver bullion guide provides tips on buying Engelhard Prospector Silver Rounds at the best price online. You can view ratings and reviews, videos and dealers that have Engelhard silver products in stock and ready to ship. The Engelhard Prospector Silver Round is not only one of the most recognized rounds for silver investors, it is one of the most highly valued. The Engelhard Corporation (Wikipedia: Engelhard) was founded at the turn of the century and is considered to be one of the classic mints. Engelhard was sold in 1986 and this ended their production of gold and silver products. The market places a higher premium on Engelhard silver because of their history, as well as their reputation for producing high quality, private mint products. Here are some quick reference notes and online dealer suggestions for those looking to buy Engelhard silver. Some dealers offer older dates in less than perfect condition, preferred by collectors trying to complete a set. Others offer new condition rounds from latter years. Silver bullion stackers with a casual collection of single rounds may prefer shinier, new condition rounds. Buying Tips: Counterfeit (fake) Prospectors have been reported in the market, so only buy from a trusted, online dealer. Stay clear of auction sites unless you have a trusted source and are seeking a specific date. This top-rated dealer offers Engelhard Prospector Rounds at a nice price, but also offers a variety of other rounds with a much lower premium, including brand new rounds fresh from the mint. Be sure to check them out. 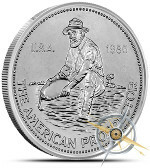 This video features the later dated Engelhard American Prospector – the version with an eagle in flight on the reverse side, rather than the “E” logo version in the older versions. Different Engelhard buyers will have different preferences as to which they prefer, while some collectors want to have every year that the prospector was produced represented in their collection. These “newer” Engelhard silver rounds arrived in pristine condition. The detail in the design is absolutely amazing. It is a shame that Engelhard Silver Rounds are no longer produced. If interested in Engelhard, the dealers linked above each carry different versions, with both at very good prices. If you collect Prospectors or have recently bought some of these rounds, provide us with a rating and review. It is quick and easy and your personal information will not be displayed. Also, if you have a preference, let other potential Engelhard investors know what year you prefer and why.